Some of Alfred Hitchcock's most beloved films were made in the 1950s, and four of them (Rear Window, To Catch a Thief, The Trouble with Harry and The Man Who Knew Too Much) were written by one man: John Michael Hayes. Though he'd earned a sterling reputation in radio, when he first met with Hitch, his screenwriting resume was rather thin. Nevertheless, the director took a gamble and contracted him to work on Rear Window. It turned out to be one of the best decisions of his career. On the morning of September 9, 1965, Alfred Hitchcock sat in his office at Universal Studios confounded that after a detailed treatment, three complete drafts, and one set of revisions, the screenplay he had been preparing for Torn Curtain was not up to par. Hitchcock had spent four months working on the scenario with the novelist Brian Moore, and then engaged the screenwriting team of Keith Waterhouse and Willis Hall to do a hasty rewrite, but still found the script lacking. Peggy Robertson, Hitchcock’s personal assistant, knew her employer was in trouble, especially after Marnie had flopped a year earlier. Robertson was Hitchcock’s most valued associate during his tenure at Universal and had remained part of the director’s entourage since serving as script supervisor on Vertigo during happier times at Paramount. At Hitchcock’s request, Robertson prepared a short list of writers she thought were skilled enough to retool the second-rate script. Hitchcock surely trusted Robertson’s judgment, but was adamantly opposed to calling one of the writers she had put on her list, even though a little more than a decade earlier the writer had been responsible for the scripts of some of Hitchcock’s major successes. For some reason—pride, anger, principle—Hitchcock refused to call John Michael Hayes. Hitchcock felt he became the Master of Suspense on his own and did not require assistance from someone whom he had made a star. In the spring of 1953 Hitchcock had faced a similar career crisis. His independent production company, Transatlantic Pictures, had failed, and his years at Warner Bros. were a mixed bag of mostly box-office failures. With its track record on the stage in London and on Broadway, Hitchcock hoped that a film of Frederick Knott’s Dial M for Murder would bring the change of luck he desperately needed. Warner Bros. purchased the rights for Hitchcock, but the studio was in financial trouble. In March the studio halted production on all new projects for ninety days, and the following month they asked their executives to take a salary cut of up to 50 percent. In a business where you’re only as good as your last film, Hitchcock could not afford to let his career come to a standstill. He instructed his agents at MCA Artists to shop around for another studio contract. In his business dealings, Hitchcock was handled personally by the agency’s president, Lew Wasserman, in addition to Arthur Park and, later, Herman Citron. In spite of the fact that Hitchcock’s performance as his own producer in Hollywood had not yet lived up to his reputation, Wasserman and company shrewdly arranged what became over the next few years a lucrative multipicture contract with the Paramount Pictures Corporation. Eager to obtain Hitchcock’s services, Paramount offered to make a deal if he would develop a script out of a story from a collection called After Dinner Story by mystery writer Cornell Woolrich (who wrote under the pseudonym William Irish). Taking Wasserman’s advice, Hitchcock chose “Rear Window.” Eager to find the perfect writer to dramatize Woolrich’s short story, Hitchcock recalled a name he heard often on the radio in connection with comedy, suspense, and detective shows. “Do you know John Michael Hayes?” he asked his agents. The response was that they certainly did—Hayes was also an MCA client. Through much of his first decade or so in Hollywood, Alfred Hitchcock worked with a number of distinguished writers, including Robert Sherwood, Thornton Wilder, Dorothy Parker, Ben Hecht, and Raymond Chandler. Impressive as this list of collaborators may be, Hitchcock still found himself in the late 1940s and early 1950s with a string of commercial failures. Hitchcock’s agents were therefore perplexed by their client’s request that they arrange a meeting with John Michael Hayes. By the spring of 1953, the thirty-three-year-old Hayes had been a popular and prolific writer of radio dramas, and although his potential as a screenwriter had been recognized, there was little evidence in his first film credits to indicate he had much to offer Hitchcock. Nevertheless, there was something about Hayes’s style that Hitchcock responded to and felt he needed. Hayes recalled, “Hitchcock had his agents and my agent get together for lunch and they handed me this book which had the short story in it called ‘Rear Window.’ They told me, ‘You’re to meet Mr. Hitchcock on Friday night at the Beverly Hills Hotel for dinner. Read the story and be prepared to discuss it with him.’” Hayes virtually memorized the story in order to anticipate what Hitchcock would ask. What color were the eyes of the hero? How many steps up to his door? How many windows across the way? Hayes prepared for a thorough examination. The dinner was scheduled for seven-thirty in the Polo Lounge of the Beverly Hills Hotel. Hayes dressed as well as he could, memorized his notes and ideas, and drove from the San Fernando Valley, over the Santa Monica Mountains, to Beverly Hills, arriving a few minutes early. By seven-thirty, Hitchcock hadn’t arrived. At quarter of eight, he still wasn’t there. And by eight o’clock, there was no sign of Hitchcock. The young writer thought he might have gotten the night or, worse, the hotel wrong, which only added to his feelings of anxiety about meeting the famous director. In need of something to calm his nerves, Hayes went into the hotel bar and explained his predicament to the bartender. Unlike many of his contemporaries in Hollywood, Hayes was a neophyte when it came to liquor and wisely set his limit at two drinks. Unaware of the potency of martinis, which the bartender prescribed as a good drink to calm one’s nerves, Hayes knocked back his drink and returned to the lobby as quickly as he could, not wanting to miss Hitchcock. Having skipped lunch that day in anticipation of a big dinner, Hayes quickly felt a warm glow from the liquor as he continued to wait. By eight-thirty, Hitchcock still hadn’t arrived, prompting the writer to retreat to the bar for one more drink before returning home. “Oh, wonderful, my favorite drink,” said Hitchcock, adding mischievously, “I like a man who drinks.” Hitchcock called the waiter to the table and ordered two double martinis. When the drinks arrived, the two men tipped glasses, and Hayes sipped as cautiously as he could. Soon after, Hitchcock called for hors d’oeuvres and another double martini for each of them. Hayes had finally got the first cocktail down, and by now was bleary-eyed, praying he would not get sick. “Mr. Hitchcock, I don’t—I think one—,” protested Hayes. “What did you think of it?” asked Hitchcock. Hayes began to give an analysis of Shadow of a Doubt from frame one to the end of the picture, telling Hitchcock what he thought he had done right, and what he thought he had done wrong, where it was strong, where it was weak, and that he didn’t particularly like the casting. The young writer continued his assessment of Shadow of a Doubt straight through the next course of steak with red wine. Blurred by the combination of martinis and fine wines, Hayes started going through Hitchcock’s movies, one by one, indicating some things that he could have done better in Notorious and telling the director that he thought the bullet stopped by the Bible in the hero’s pocket in The 39 Steps was kind of corny. While Hayes talked, Hitchcock said nothing, and just continued eating and drinking and munching and crunching and slurping. 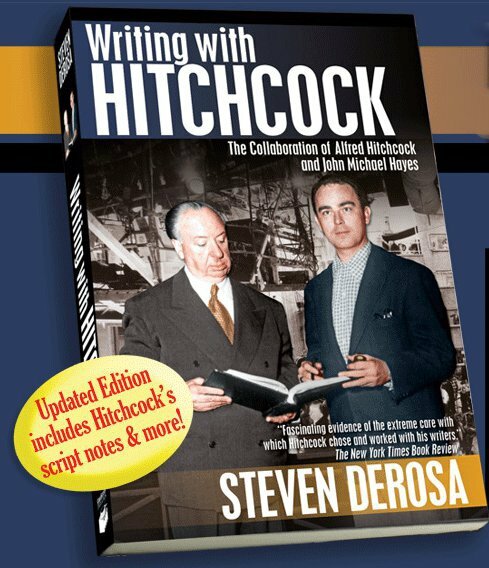 Writing with Hitchcock: The Collaboration of Alfred Hitchcock and John Michael Hayes by Steven DeRosa is available in a new, expanded edition in print and e-book formats at Amazon.com, Barnesandnoble.com, Apple iBookstore, and Lulu.com. Signed copies are also available at WritingwithHitchcock.com You can follow updates from the author on Facebook, Twitter, and YouTube. I HOPE YOUR PLEASURE IS IN THE POST OF TOUCH OF CINNAMON poetizing, STAR WARS, Chariots of Fire, Out of Africa, CHAPLIN MONOCULAR NAME OF THE ROSE, ALBATROS GLADIATOR, HOLLY Wuthering Heights, ENEMY AT THE GATES, PUPPY, PHANTOM OF THE OPERA BLADE Ruun, CHOCOLATE AND TWILIGHT 1 Y2.